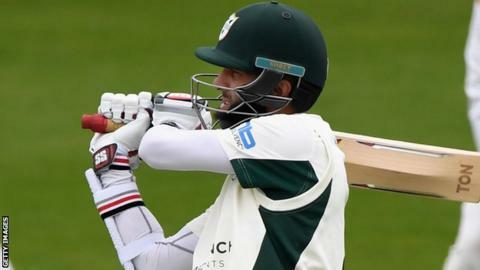 England's Moeen Ali scored a half-century in his first game of 2017 for Worcestershire as 16 wickets fell on day one against Northants at New Road. The all-rounder made exactly 50 before being bowled by former Notts seamer Andy Carter (3-51), who came out of retirement to play for the visitors. Nathan Buck also took three wickets as Worcestershire were bowled out for 188. Home captain Joe Leach claimed four wickets as Northants made 102-6 before bad light brought an early close. England's Ben Duckett will resume on 45, alongside all-rounder Steven Crook, with their side trailing by 86. The gloomy overhead conditions were ideal for seamers, but Worcestershire looked well placed after lunch at 117-3, before Moeen's dismissal sparked a collapse which saw them lose their last seven wickets for 71. "It's honours even. We did well to get to 190 at one point because we were losing wickets left, right and centre for a while. "We fought back really well with the ball but they've got away with a run rate we are not overly happy with so overall it is still pretty even. "The two England players, Moeen Ali and Ben Duckett, both showed their qualities in being able to adapt. You don't get wickets like that in international cricket. It didn't look an easy day for batting at all. But that comes from experience and quality." "I had a few phone calls from a few different people saying I had stopped playing too early so I thought I'd try and give it another shot. "I played for the seconds last week and took five wickets. They've got a few injuries this week. They rang me yesterday afternoon saying they'd got a few issues and they didn't know what the pitch was like and said can you come down. "I've been working for a good friend as a self employed tiler. That is what I've been doing since October. Yesterday I was on a building site until five o'clock. I did not drive down to Worcester until half past five this morning."